Work-related stress is a growing problem that affects not only the health and well being of employees, but also the productivity of organisations. Surveys in Ireland have reflected it as one of the most common work illnesses. Stress can be broadly defined as the negative reaction people have to aspects of their environment as they perceive it. Stress is therefore a response to a stimulus and involves a sense of an inability to cope. We each perceive, interpret, cope with and react to the world differently, but a stress reaction is an unpleasant state of anxiety. Stress is not an illness – it is a state. However if stress becomes excessive or prolonged there is a risk that mental or physical illness could develop. Also,, there is a difference between pressure and stress. Pressure can be positive and motivating and is sometimes essential in our work as it helps us achieve our goals and perform better. Stress arises when this pressure becomes excessive – it is a natural reaction to too much pressure. Work Related Stress (WRS) is stress caused or made worse by work. It arises where work demands or the demands of their working environment exceed the person’s capacity to cope. It can be caused by perceived/real pressures or deadlines or by perceived/real threats or anxieties within the working environment. Work related stress can be experienced by anyone at any level in their work and is not confined to particular sectors, jobs or industries. Work related stress can be caused by various events. For example, when a person feels under pressure if the demands arising from the number of hours, workload, or responsibilities are greater than they can comfortably manage. Other sources of stress can include conflict with co-workers or bosses, constant change, threat to job security or potential redundancy. Capacity to deal with stress varies from person to person and what one individual may perceive as stressful, another may view as challenging. 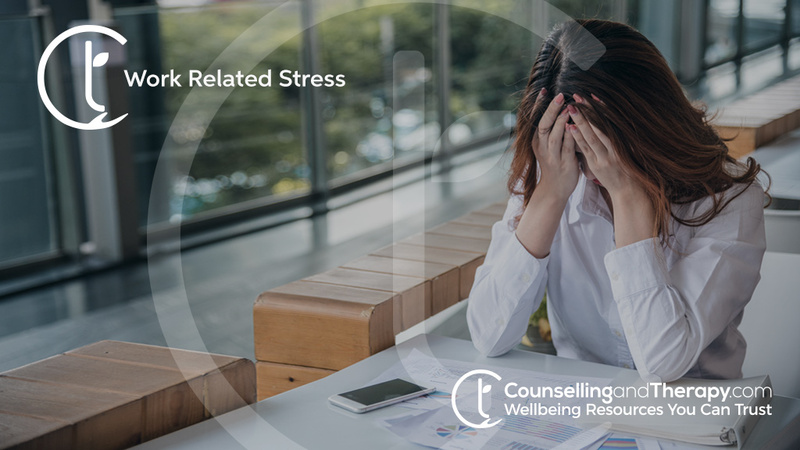 Whether on not someone experiences work related stress depends on the job, the person’s psychological make-up and other factors such as their personal life and their general health. Unfortunately Work Related Stress impacts on our personal lives as well as our professional one. Persistent WRS takes a significant toll on your health and wellbeing and can lead to, for example: poor concentration, headaches, stomach and gastrointestinal problems, anxiety, insomnia, raised blood pressure, depression and can contribute to obesity and heart disease. The effects on ongoing stress can be compounded by unhealthy coping mechanisms such as poor eating habits, overeating, smoking, alcohol consumption and drug use and abuse. If necessary keep a log or journal and note the circumstances and setting and include how you dealt with each situation. Note what was helpful. Think about the changes you need to your work to reduce your stress so that you can take action. An open conversation where you can come up with an effective plan will help you perform at your best as well as improving your well being and so is in everyone’s interest. Training, additional resources or support may be required to reduce the strain so be clear about what you need to improve your working environment and discuss this openly and honestly so you can agree with together. Put some boundaries in place for yourself. In a digital environment it is easy to feel pressure to be available 24 hours a day so it may be important to ignore or remove email access outside of working hours or to resist logging in to the office to check how things are going. Setting clear boundaries between work and home life creates a distance between these two aspects of your life and consequently can alleviate stress by bringing a real break from work out of hours. Talk to a trusted friend or family member about your work related stress. It is always good to share a problem and they may have a helpful perspective on the situation. If there is an EAP (Employee Assistance Programme) avail of this for yourself as it can provide psychological support, counselling or referral to other health professions as necessary. If there isn’t such a service, see a Counsellor or Psychotherapist separately and this can provide you with valuable support at a time like this. After work or at weekends do something relaxing and which supports your well being and helps you get away from a difficult work environment. Get outdoors for a walk or cycle, take a regular yoga class or do some meditation to help you wind down and recharge your internal battery. Make time for a hobby or activity you like and spend time with those you care about and who bring pleasure to your life. Switch off the gadgets and avoid social media if these are interfering with your ability to unwind and be fully present to your family and friends. Don’t try to fight stress with fast food or alcohol or use it to help you sleep at night. Look after your body and eat healthily. Limit your caffeine and get plenty of sleep at night. While a difficult work environment can create stress and unhappiness in your life, it is not permanent and there are a number of things you can do to improve it. And remember, if you don’t achieve the success you need you can also consider a change of job to being you the environment and job satisfaction you need.